The Executive Division is charged with the responsibility of managing and operating the agency and implementing the Indigent Defense Act, found in Sections 1355 -1370.1 of Title 22 of the Oklahoma Statutes. By statute, the Executive Director is selected by and serves at the pleasure of the Board. To aid the Executive Director in the implementation of the Indigent Defense Act and agency operations, the Deputy Executive Director oversees the System's Finance Unit along with all administrative functions within the agency. The Finance Unit maintains approximately 300 contracts each year with private attorneys and expert service providers in Oklahoma, and processes claims for payment of those professional services. The powers and duties of the Executive Director are set out in the Indigent Defense Act at Section 1355.4 of Title 22. In addition to being responsible for the overall operations of the agency, the Executive Director is required by statute to take actions to improve the criminal justice system in the State, to provide training and continuing legal education to indigent defenders throughout the State, to recommend legislation, to submit an annual report on the implementation of the Indigent Defense Act, and to take measures to ensure effective representation for indigent criminal defendants. 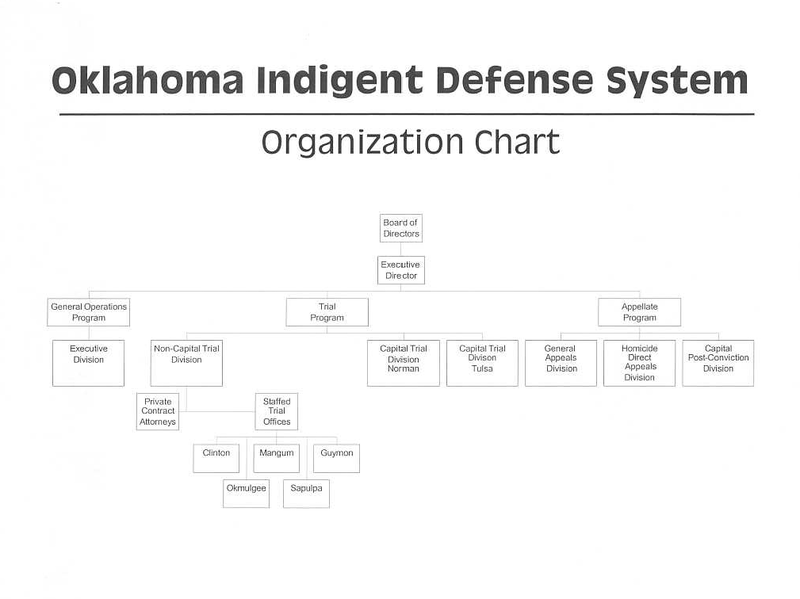 The Indigent Defense System employs 110 full-time staff members, including some 65 attorneys. The System's main office is in Norman located at 111 N. Peters Ave. in Norman. Satellite offices are located in Clinton, Guymon, Mangum, Okmulgee, and Sapulpa. When conflicts of interest make it impossible for the System to represent an indigent defendant, the case is contracted to private counsel willing to provide legal services at rates established by the System. The Executive Division is responsible for providing conflict counsel and defense services in all capital trial and appeal cases and non-capital appeals. The Non-Capital Trial Division is responsible for providing such counsel in non-capital trial cases. The Trial Program consists of three divisions which provide representation to agency clients who have been judicially determined to be unable to afford counsel to defend against charges brought by the State. The right to counsel at State expense was established by the United States Supreme Court in Gideon v. Wainwright, 371 U.S. 335 (1963). The right to expert assistance at State expense was established by the United States Supreme Court in Ake v. Oklahoma, 470 U.S. 68 (1985). The purpose of the Trial Program is to fulfill the State’s obligations that accompany the right to represent a defense to criminal charges, including requirements imposed by the Federal Constitution. 4) assignment of cases to a roving attorney. The Division satellite offices are located in areas where contract expenses have been typically higher, or there was in inadequate level of interest expressed by the private sector in providing the necessary legal services. The Clinton office provides legal services for appointments in Beckham, Custer, Dewey, Ellis, Roger Mills, Washita and Woodward Counties. The Guymon office provides legal services for appointments in Beaver, Cimarron, Texas and Harper Counties. The Mangum office provides legal services for appointments in Greer, Harmon, Kiowa, Jackson and Tillman Counties. The Cleveland County office, located in the agency’s main office in Norman, provides legal services Cleveland County. The Okmulgee office provides legal services for appointments in Okfuskee and Okmulgee Counties. The Sapulpa office provides legal services for appointments in Creek County, which has three courthouses. The Appellate Program consists of three Divisions that provide different types of representation to agency clients who have a right under State law to appeal their convictions and sentences and have been judicially determined to be unable to afford appellate counsel. The right to an appeal in a criminal case is guaranteed by Article 2, Section 6, of the Oklahoma Constitution, Section 1051 of Title 22 of the Oklahoma Statutes, and, in death penalty cases, by Section 701.13 of Title 21 and Section 1089 of Title 22 of the Oklahoma Statutes. The right to counsel at State expense on direct appeal was established by the United States Supreme Court in Douglas v. California, 372 U.S. 353 (1963). The right to counsel at State expense in capital post-conviction proceedings is found in Section 1089 of Title 22. The purpose of the Appellate Program is to fulfill the State¿s obligations that accompany the right to appeal, including requirements imposed by the Federal Constitution. The General Appeals Division is appointed by the district courts of Oklahoma to represent clients on direct appeal from the trial court to the Court of Criminal Appeals in all felony cases, and in misdemeanor or traffic cases where the defendant is sentenced to serve a term of imprisonment. The General Appeals Division is appointed by the district courts in 75 counties, and in Oklahoma County and Tulsa County when the public defenders have a conflict of interest, or the defendant was represented by retained counsel at trial and is judicially determined to be indigent on appeal. The Homicide Direct Appeals Division is appointed by the district courts of Oklahoma to represent clients on direct appeal from the trial court to the Oklahoma Court of Criminal Appeals in cases where the defendant is sentenced to die. Direct appeal in a capital case also includes filing a petition for a writ of certiorari in the United States Supreme Court if the case is affirmed by the Court of Criminal Appeals. The Capital Direct Appeals Division is appointed by the district courts in 75 counties, and in Oklahoma County and Tulsa County when the public defenders have a conflict of interest, or the defendant was represented by retained counsel at trial but is judicially determined to be indigent on appeal. The Capital Post-Conviction Division is appointed by the district courts or required by statute to represent all death-sentenced defendants in post-conviction proceedings. By statute, the Capital Post-Conviction Division must represent all death-sentenced defendants, including those who were represented by the Oklahoma County or Tulsa County public defenders on direct appeal. Since November 1995, post-conviction applications in a death penalty case are filed in the Court of Criminal Appeals while the capital direct appeal case is still pending. Before the statutory changes, post-conviction applications in a death penalty case were filed in district court after the capital direct appeal case was decided by the Court of Criminal Appeals.